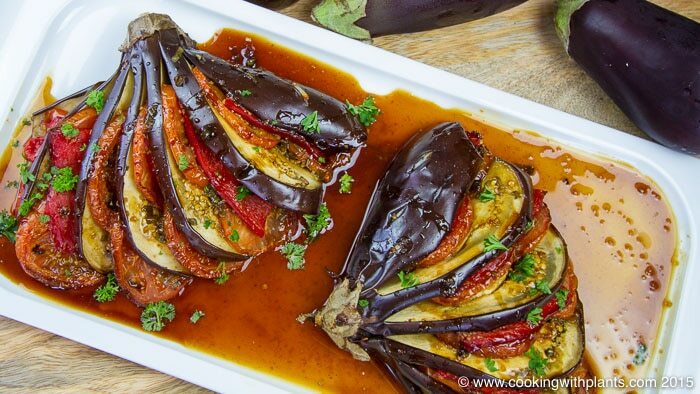 Want to make fancy eggplant with wow factor… then look no further than this super tasty Oven Roasted Eggplant recipe! Topped with a full bodied Maple Balsamic Glaze, the combination of Mediterranean flavors will leave your taste buds doing a happy dance. Great for christmas lunch or dinner, a festive party or any time you want to cook to impress – this is a must! Slice the eggplants lengthways (about 1cm/1/2 inch thick) sections, making sure that you don't cut all the way to the tail of the eggplant. You want to keep the eggplant still in one piece so it can be pushed down to form a fan shape (see video at top of this page for demo). Place the eggplants onto a baking tray lined with non-stick parchment paper. With the solid side sections of each eggplant, cut some random slits through the skin and fill with some slithered pieces of garlic. Evenly place slices of tomato into the gaps of the eggplant sections. Be sure to fan out the eggplant as you go. Evenly place the peppers/capsicums over the tomatoes and into the eggplant gaps. Get a mixing bowl or large glass jar with a screw top lid and place all of the glaze ingredients (except the corn starch) in there. Stir or shake until well combined. Using a basting brush, baste the eggplants with about 1/4 to 1/2 of the glaze mixture and make sure it goes into all of the nooks and crannies of the eggplants. Place the eggplants in the oven and bake for approximately 45 minutes or until cooked to your liking. Place the left over glaze liquid and the corn starch into a small pot or pan. Prior to turning on the heat mix all of the ingredients together so that you don't end up with lumps in your glaze. Turn heat on to medium-high and stir constantly until the mixture thickens. Remove from heat and set aside until your eggplant finishes baking. Remove eggplants from oven and lift onto a plate or serving platter. I like to use a large spatula to do this. Pour any eggplant cooking juices into the glaze mixture and stir together. Drizzle over the eggplant and serve. YUM! You could also fill these with slices of potato, zucchini and mushrooms. We got a um, dance and a yum. Must be good. lol… yes, it is super delicious! One of my favorite recipes yet – and I’m normally not even an eggplant fan! This looks amazing. I need to buy an eggplant ASAP. The photo (posted at Vegan Mainstream Cookbook Club) looked so wonderful that we tried it a few days ago. It didn’t work. The eggplant did not get cooked. Even the garlic that was put into the eggplant ends was not cooked! But we loved the decadent glaze. We enjoyed the cooked tomatoes, peppers, and glaze over rice. We’ll chop up the eggplant and braise it with tofu and that marvelous glaze, and serve it over rice. So glad you like it. Your eggplants may have been larger than mine or possibly older, which can sometimes make them a little tough. Thanks Anja…I love eggplant. Would you have a eggplant lasagna recipe at all? Chef AJ has an eggplant lasagna recipe, with and without pasta. I should have qualified that. A pasta free eggplant lasagna recipe. Yes!!! I now have a great idea for my small Christmas dinner other than Lentil Loaf!!! What an excellent dish! I made this over the weekend and it came out perfectly. So delicious. I used the roasted red peppers and sliced tomatoes. I sautéed some sliced onions, garlic and scallions and inserted them between the slices also. Thank you so much for an absolutely delicious dish!!! Anja, your cooking always encourages me to try new veggies. This was great! I had a single medium eggplant cooked it for 35 min on 350 F(US). You have totally gained my trust. If you make it, I make it. You haven’t steered me wrong yet! 2nd time I made this along with many of your recipes. You are definitely a great Chef. Will continue to be inspired by your skill and talent. Great recipes, website and channel. Thanks very much for sharing yourself with all of us. Donald. Thank you so much Donald. Great to have you here and glad you’re enjoying the recipes.